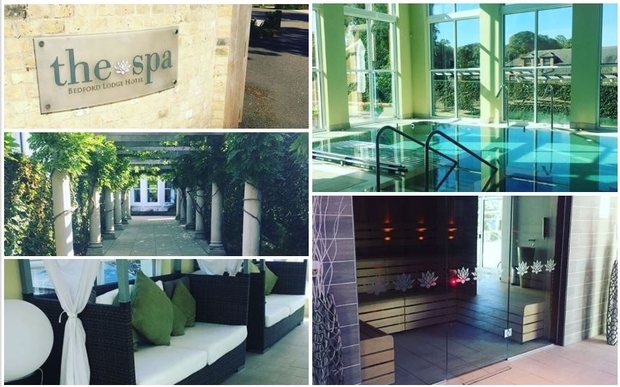 I was delighted to be invited to spend the day at the beautiful spa to experience a ESPA Mindful Massage. The tranquil spa is set in the grounds of the Bedford Lodge Hotel, the only luxury four Red Star hotel in Newmarket, Suffolk. The friendly therapists welcomed my wife and me and showed us around the spa – which boasts a wide selection of facilities to enhance your time there. Ready for our day of relaxation we headed to the changing rooms to slip on our swimwear – soft robes, towels and slippers were waiting for us in our lockers. The changing rooms boasted a luxurious setting with ESPA products available for freshening up, hairdryers and GHD hair straighteners (which was my saviour after my head massage) and walk-in rainfall showers. As you walk into the spa area, the quiet, calm setting instantly helps you unwind from everyday life. We took full advantage of the facilities and experienced the spacious hydrotherapy pool; this includes 5 unique water experiences, with perfectly placed water jets to ease away aches and pains, the thermal area; the ideal way to loosen muscular tensions before your treatments and allow the mind to relax - this area includes a steam room & sauna, and the experiential showers and ice fountain to help cool down after the heat experiences. Experiencing the blissful spa facilitates was therapy for both the mind and body - perfect for brides who are opting from a relaxing hen do with their best girls or even looking for a pre- or post- wedding day of relaxation with their partner. The Spa Mezzanine area is the perfect place to relax in between treatments, the mezzanine has relaxing beds for you to read a book, take a nap, or just enjoy the tranquillity of the spa. As it was such a gorgeous summers day that we chose to head to the rooftop hot tub whilst waiting for our treatments. This area was a perfect little sun-trap, overlooking the famous racing paddock. “This holistic, deeply relaxing and clarifying experience begins with mindfulness. Guiding you through breathing and visualisation techniques, your therapist will help calm both mind and body. The metamorphic zones on the feet are then massaged to rebalance and ground, before a soothing massage is continued up through the body, finishing with a re-energising scalp massage using warm Rose Quartz Crystals. My talented therapist certainly made me feel 'more in the present' during and after my treatment. She showed a high standard of knowledge and even gave me some after care advice. I headed to the Relaxation Room feeling rejuvenated and recharged. Here, you're greeted by calming music and an array of comfortable sofas to sink into and fall asleep under our soft blankets. As we were experiencing such glorious weather we chose to enjoy our lunch on the tranquil terrace area, which gave views of the spas pretty garden and beautiful water fountain. I opted for the Grilled Courgette, Feta & Baby Spinach Panini, washed down with super-tasty Tropical Fruit Smoothie. My wife, Natalie, chose the Satay Sweet Potato Curry & Rice washed down with a smooth Mocha. Both of our lunches were well presented and tasted delicious. We ended our wonderful day relaxing on the loungers, reading our books and enjoying the peaceful setting. The Bedford Lodge Spa has a fantastic array of bridal packages, from Pre Wedding Prep, Bridal Top to Toe and The Ultimate Bridal Experience. The Celebration Day package is perfect for you and your bridesmaids too – available for up to 8 people for just £86 per person.